1- The sign on this train station's walls says it's "Britain's busiest train station"
2- An old comedy line about taking trains always ended with "And Change at Xxxxx" - like you always have to change at this station wherever you're going. 3- Britain's National Rail Museum is located in what city? 4- The world's first passenger train ran between which two English cities? 5- Parts of Harry Potter films were shot on this awesomely gorgeously scenic Scottish train line? 6- The U.K.'s furthest north train station? 7- the U.K.'s furtherest west train station? 8- The U.K. most southern train station? 9- The U.K.'s furtherest most east train station? 10 - Where is the Ffestiniog Railway? 4. This is going to be fun. 5 On the line between Fort William amd Mallaig, in particular the Glenfinnan viaduct. 10 North Wales. It runs between Porthmadog and Blaenau Ffestiniog. 4. So The Mumbles - Swansea railway doesn't count. 4. I've not come across the Mumbles Swansea railway so had to go to Wiki to find out about it. It did preceed the Manchester Liverpool. Trains were pulled by horse power rather than steam. You live and learn. 7. Do you know, I've a terrible confession, I'd completely forgotten Northern Ireland! The perpetrator of the quiz admits to being too vague about # 4 - I meant with steam not horse power so all answers are right for their respective traction power methods. 7 - I do believe Derry takes the prize for furthest U.K. rail station to the west. ESW is today's champion and gets a free year on Fodor's forums! "The sign on this train station's walls says it's "Britain's busiest train station""
No organisation in Britain would descend to putting up a slogan in American. It's possible - just - that there's a statement at Clapham Junction that it's Britain's busiest railway station. Though it sounds extraordinarily unBritish to waste energy emblazoning the fact in public. But the sign was (and is?) there. I travelled through there enough times to and from school. The signs certainly had been u since the time of peak stiff-upper-lippery, somewhere soon after nationalisation, I suspect - perhaps in some sort of effort to persuade people there was some sort of bright side to overcrowding, clapped-out trains and stations not decorated since the 30s? Since when was Mumbles either English or a city? 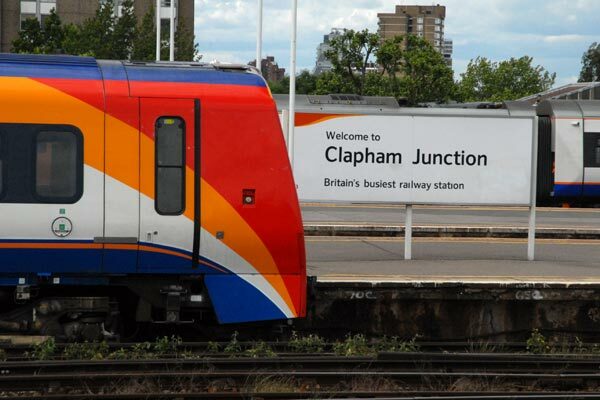 "It's possible - just - that there's a statement at Clapham Junction that it's Britain's busiest railway station. Though it sounds extraordinarily unBritish to waste energy emblazoning the fact in public." It's good to see we still use the the word 'railway' rather than 'train'. I hate being a 'customer'. I'm a PASSENGER! Being pedantic PalenQ, Londonderry and Derry are both the same place. Derry is the modern name as the 'London' bit was regared as inflammatory. Just as a matter of interest, what is the correct answer ro 2?
" Londonderry and Derry are both the same place. Derry is the modern name as the 'London' bit was regared as inflammatory"
so such more complicated than this. I want to go to Birmingham, and they've taken me on to Crewe! Oh Mr Porter, what a silly girl I am! I guess it would depend on what the train station in London(Derry) is called and I suppose it's Londonderry. and of course the correct answer to # 7 would also be Londonderry, not Milford Haven. Yes flanner is of course correct - I was just juggling my American mind in recalling that sign I've seen a zillion times - yes railway station - good show old chap! I said it would be fun. Do you say it's The Mumbles railway which was the first passenger carrying railway - though horsedrawn, then you have the Stockton Darlington line which was the world's first publicly funded railway and which carried passengers using a mixture of horse and steam or do you use Manchester - Liverpool which was the world's first fully steam powered passenger railway. When I was in Manchester I visited what was said to be the world's oldest railway station, now a museum and part of the Underground Manchester museum showcasing the city's ancient sewage system. Liverpool Road - it closed in 1844. "When I was in Manchester I visited what was said to be the world's oldest railway station, now a museum and part of the Underground Manchester museum showcasing the city's ancient sewage system." It also includes the Science and Industry Museum and is excellent. It has a fascinating section looking at the development of steam power. I've just had a Brief Encounter with this thread.